This is a multi-day instructional unit for middle school science on kinetic and potential energy. Through investigations of waterwheels, roller coasters, bouncing balls, and a pendulum, students get a feel for energy transformation in a mechanical interaction and build accurate concepts about the Law of Conservation of Energy. The unit also introduces static and kinetic friction, drag, elastic/inelastic collision, and students learn to calculate frictional force. Lessons are all aligned to AAAS Benchmarks, and may be conducted separately or in concert. Editor's Note: Understanding mechanical energy is at the root of many engineering applications in our world. This set of lessons provides inquiry-based exploration, while also introducing simple calculations in the context of real-life situations. It is developmentally appropriate for middle school, but will definitely challenge students. 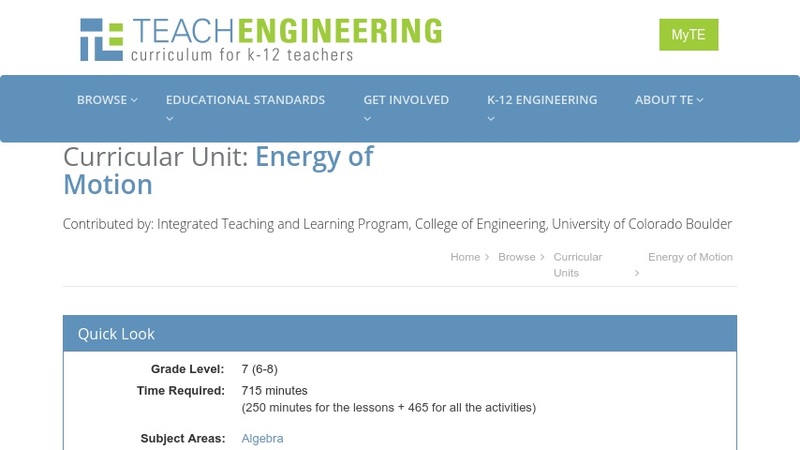 TeachEngineering is a Pathway project of the National Science Digital Library. It provides a large collection of teacher-tested, research-based content for K-12 teachers to connect real-world experiences with curricular content.